Every year on February 22, the Church celebrates the Feast of the Chair of St. Peter. Confusing to many, this feast is less about an ancient piece of furniture than it is about the office of the pope and his role as a sign of unity and peace. If you ever get the chance to visit St. Peter’s Basilica in Rome, you will notice a large, baroque chair suspended above the altar at the very back of the Church. It’s so ornate and tall that you’ll wonder how anyone (even a great saint like Peter) could ever have managed to sit in it. Unbeknownst to most visitors is that all the ornamentation is actually just a fancy bronze encasement for a very plain, very old oak chair. The age of that original chair is uncertain, and equally uncertain is whether or not St. Peter ever actually sat in it. But that’s ok. Honoring the Chair of St. Peter is not really about the piece of furniture. It’s about remembering the office, mission and promise of Christ that the chair represents. First, a chair is the sign of authority tied to an office. Think about all the places that chairs represent an official authority in our culture. We have chairs of the board, chairs of an assembly, chairs of departments and endowed chairs at universities. Even the fabled thrones of royalty still hold sway in our consciousness. The important thing to remember about these chairs is that the office and authority they represent is tied to the position itself and not to the individual who fills it. Similarly, the Chair of St. Peter symbolizes the office and authority that Christ bestowed on Peter, the same office and authority taken up by Peter’s successors to this very day. Second, a chair is symbolic of a certain disposition. To be seated is to be in a position of patience and listening, hospitality and charity. Remembering the Chair of St. Peter through this lens recalls Peter's role (and the role of all popes since) to be the Supreme Pontiff, or the greatest bridge-builder. By this we mean that the pope is a sign and instrument of Christ’s unity and peace, a builder of bridges among people and of bridges between people and God. An early example of this pontifical bridge-building appears in Acts 15 when St. Peter unites the Church on the question of Gentile converts to Christianity and whether or not they must obey Jewish dietary law. At every ecumenical council that has followed (and in hundreds of other instances throughout history), the sitting pope has been a locus of unity and peace both for people within and without the Church. In our own time as well, it’s easy to recall instances when our popes have been signs and instruments of unity and peace for the Church and the world. There are a number of ways that you and your family can celebrate this feast day. Pray for the pope, your local bishop and the unity of the Church. Our leaders in the Church rely on the prayers of the faithful. It is especially fitting on this day to pray that God grants them whatever grace they need to fulfill the duty of their office. Since the Chair of St. Peter also symbolizes the unity of the Church, today is a good day to pray for an end to divisions within the Church. This includes division and politics within the Catholic Church as well as the divisions that separate Catholic, Orthodox, Protestant and other branches of Christianity. Write a letter to the pope or your local bishop. Once you and your family have prayed for the pope and bishops, write them a letter. You can assure them of your prayers, ask for their intercession and wish them a happy feast day. I am certain they would be delighted to hear from you! Go to Sunday Mass this weekend at the cathedral in your diocese. Every bishop occupies his own chair that participates in the succession and mission of Peter’s office. Cathedra means “seat” in Latin, and it’s why the church where a bishop holds his office is called a cathedral. Most cathedrals have a physical cathedra in a place of prominence (just like at St. Peter’s Basilica) to symbolize the authority and peace-building ministry of the local bishop. You can point out the cathedra to your children and explain its connection to the Chair of St. Peter. Switch seats at the family dinner table. To help children understand the symbolic importance of chairs, have them sit in mom or dad’s chair at the dinner table or in the living room. Make miniature “dessert chairs” with your family. Having dessert is a sure fire way of helping children understand that an occasion is important. Making a miniature dessert chair out of cookies, cake, ice cream or Rice Krispy treats will serve as a fun activity, but also reinforce the memory and celebration of the feast day. Bring out a family heirloom and share it with your children. 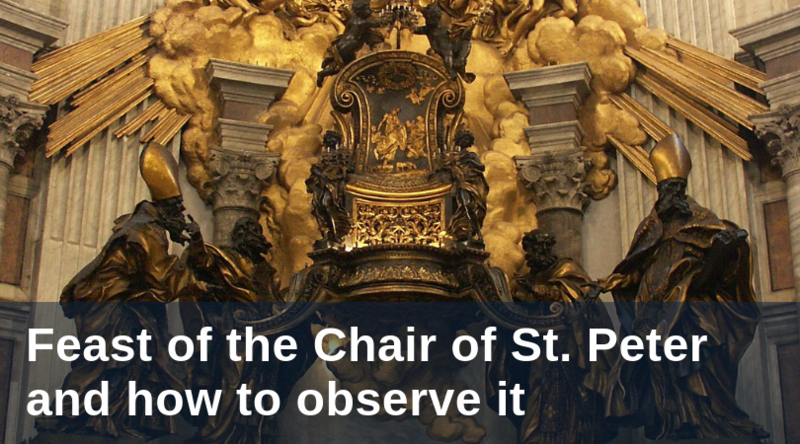 The physical Chair of St. Peter is one of the innumerable “family heirlooms” of the Church. This day can be an opportunity for you to share the memory of a person who was influential in your life, a leader in your family or a particularly great Christian witness. After explaining the family heirloom, you can explain that one day it will be passed along to your children. In the same way, the Chair of St. Peter has been passed along from generation to generation in the Church, and we are all in some way responsible for taking care of it both physically and symbolically, by living out in our own lives St. Peter’s mission of peace and unity.